Mary had something special planned to celebrate Toby’s 40th birthday. She needed the whole day for preparation so she arranged Toby’s fellow track rats and 17-hour karting enduro teammates Michael, Sam. and Lashdeep to take him go-karting. Michael came by around 10:30. Sam was running late so we warmed up with some Forza Motorsport. After a big lunch (that probably slowed our karts) the crew arrived at Allsports Grand Prix. They drove four sessions. It was great to get back in a kart after over a year. There were some slower traffic they had to work through, but also a couple very fast guys who they could pick up a few tenths from. After karting Michael offered to drop Toby off at home first. When they turned into the cul-de-sac Toby noticed there were many cars and including a few that he recognized. (Yes he is a car guy.) There was also a big white van on the driveway. When he opened the door he saw many pairs of shoes in the entryway and heard a big “SURPRISE!” Mary threw him a big surprise birthday party with many friends, colleagues and neighbors. She was planning this for months and she even had friends came all the way from New York. 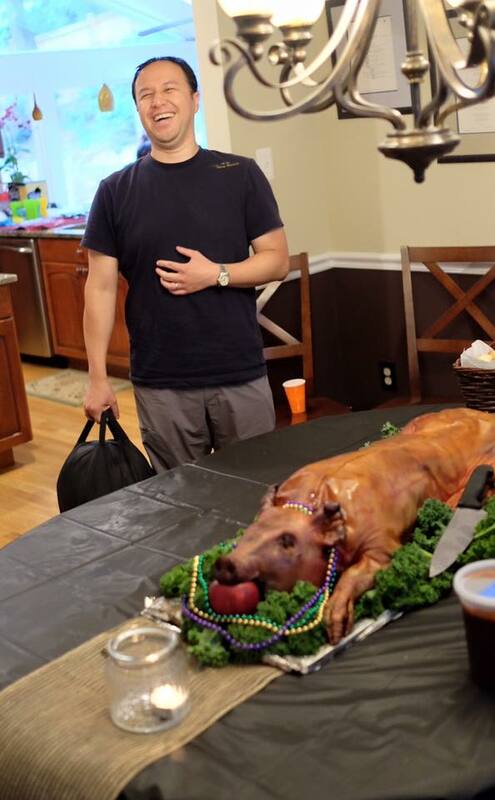 Toby headed to the dining room, still with his helmet in hand, and another surprise… a 40 lbs whole hog! And to go with their 6-year tradition there were many other pork and bacon-themed appetizers, entrees, and deserts (yes deserts!) too.